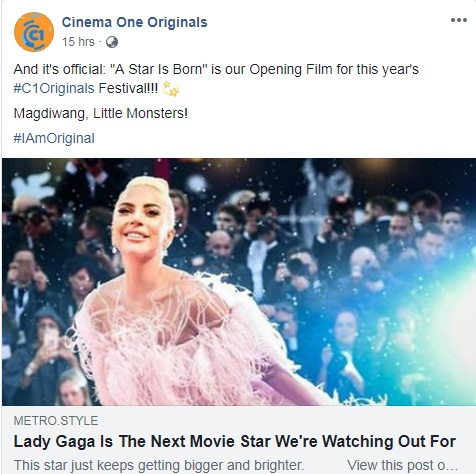 Check out the trailer below and watch “A Star is Born” in Philippine cinemas October 10. 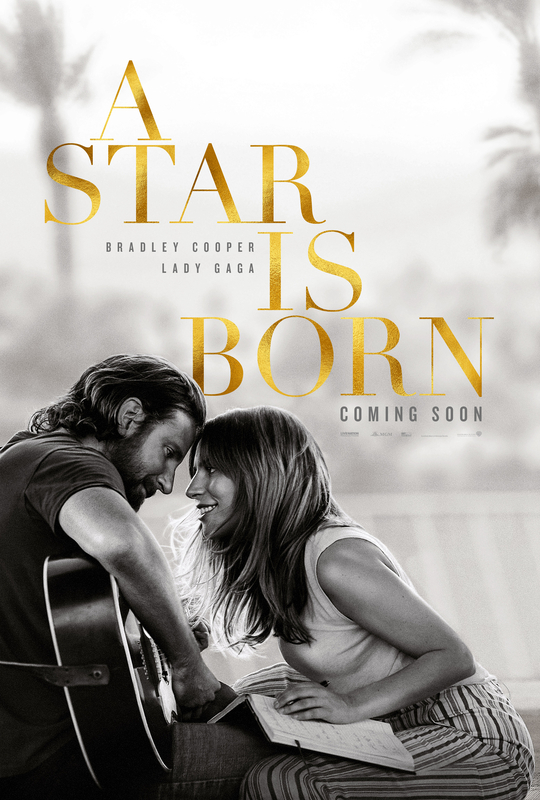 “A Star is Born” stars four-time Oscar nominee Bradley Cooper (“American Sniper,” “American Hustle,” “Silver Linings Playbook”) and multiple award-winning, Oscar-nominated music superstar Lady Ga ga, in her first leading role in a major motion picture. Cooper helms the drama, marking his directorial debut. In this new take on the tragic love story, he plays seasoned musician Jackson Maine, who discovers—and falls in love with—struggling artist Ally (Ga ga). She has just about given up on her dream to make it big as a singer… until Jack coaxes her into the spotlight. But even as Ally’s career takes off, the personal side of their relationship is breaking down, as Jack fights an ongoing battle with his own internal demons. In addition to playing Ally, Ga ga, who earned her Oscar nod for the song “Til It Happens to You” from “The Hunting Ground,” performs original songs in the film, which she wrote with Cooper and a handful of artists, including Lukas Nelson, Jason Isbell and Mark Ronson. All the music is original and was recorded live. “A Star is Born” is distributed worldwide by Warner Bros. Pictures, a Warner Bros. Entertainment Company. 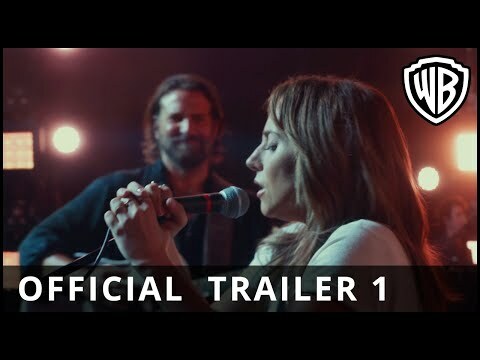 Putting his own stamp on the tale with his contemporary take on “A Star Is Born,” director/writer Bradley Cooper strove to make something that speaks to the timeless nature of human feelings and failings, mixed with today’s diverse world of music. In the film, a powerful soundtrack of original songs underscores every emotion, and an intimate lens captures each look and every touch. To translate the awesome nature of what it’s like to be among the world’s most popular musical artists performing in arenas around the world before tens of thousands of fans, the filmmakers shot in such iconic locations as Los Angeles’s Greek Theater, The Forum and The Shrine Auditorium, and on the stages of the Coachella and Stagecoach music festivals, as well as “Saturday Night Live.” Cooper turned to celebrated cinematographer Matthew Libatique to capture both the intimacy and the spectacle of Jack and Ally’s world, and production designer Karen Murphy and costume designer Erin Benach to bring it to life. Cooper surrounded himself with an equally impressive ensemble cast. In addition to Ga ga, he tapped the likes of Sam Elliott, Dave Chappelle and Andrew Dice Clay to play roles critical to understanding who Jack and Ally are and where they’ve come from, along with Anthony Ramos as a friend who’s got Ally’s back, and Rafi Gavron as a manager who steers her toward her future. In “A Star Is Born,” Bradley Cooper and Lady Ga ga fuse their considerable talents to depict the raw and passionate tale of Jack and Ally, two artistic souls coming together, on stage and in life. Theirs is a complex journey through the beauty and the heartbreak of a relationship struggling to survive. In this new take on the iconic love story, four-time Oscar nominee Cooper (“American Sniper,” “American Hustle,” “Silver Linings Playbook”), makes his directorial debut, and also stars alongside multiple award-winning, Oscar-nominated music superstar G aga in her first leading role in a major motion picture. Cooper portrays seasoned musician Jackson Maine, who discovers and falls in love with struggling artist Ally. She has given up on her dream to become a successful singer, until she meets Jack, who immediately sees her natural talent. This is going be huge! Can't wait to see this in cinemas! But why October 10th?!! Huhuhu! 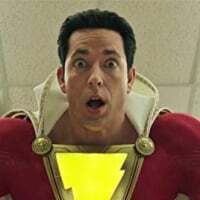 Looking forward to this movie! Sana ipalabas na agad! 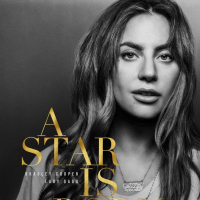 Multiple award-winning, Oscar-nominated music superstar Lady Ga ga stars in Warner Bros. Pictures’ “A Star is Born,” her first leading role in a major motion picture. In the film, Bradley Cooper (who also directs the film) portrays seasoned musician Jackson Maine, who discovers and falls in love with struggling artist Ally (Ga ga). She has given up on her dream to become a successful singer, until she meets Jack, who immediately sees her natural talent. In addition to playing Ally, Ga ga—who earned an Oscar nod for the song “Til It Happens to You” from the film “The Hunting Ground”—performs original songs in the film with Cooper, which they wrote with a handful of artists, including Lukas Nelson, Jason Isbell and Mark Ronson. The music is original and all vocals for the movie were recorded live during filming. Lady Ga ga is a Grammy and Golden Globe winner and Academy Award-nominated, one-of-a kind artist and performer. She has amassed an outstanding 31 million global album sales and 171 million single sales, making her one of the best-selling musicians of all time. Gaga is also one of the biggest living forces in social media, with over 60 million likes on Facebook, over 76 million followers on Twitter and over 29 million followers on Instagram. Her fifth studio album, Joanne, was released in October 2016 and debuted at #1 on the Billboard Top 200, marking her fourth consecutive #1 album—the first female to do so in the 2010s. In 2015, Gaga starred in the fifth installment of the Ryan Murphy FX drama “American Horror Story: Hotel.” The role earned her a 2016 Golden Globe Award for Best Actress in a Mini-Series or TV Film. Last September, she released her Chris Moukarbel-directed documentary “Lady Gaga: Five Foot Two” via Netflix. In 2012, Gaga launched the Born This Way Foundation, a non-profit organization dedicated to empowering youth, embracing differences and inspiring kindness and bravery. She is also an outspoken activist, philanthropist and supporter of many important issues, including LGBT rights, HIV/AIDS awareness and body image issues. Wala bang pa-advance screening? 🤣🤣 I can't wait until October 10th habang ang ibang bansa earlier than October 5th na ipapalabas, yung iba may pa-advance screening. Ahahaha! Buti pa yung soundtrack mapapakinggan na sa October 5th. Nagleleak na nga yung songs. Sana maging huge hit itong movie na to at makakuha siya ng Oscar trophy. Ang hirap nun. Ahahah! I have link ng leaks ng 3 pop songs. WDYT, HBF, and Heal Me. Gusto mo? Ahahahah! Four-time Oscar nominee Bradley Cooper makes his directorial debut with Warner Bros. Pictures’ A Star Is Born. In this new take on the iconic love story, Cooper and Lady Ga ga fuse their considerable talents to depict the raw and passionate tale of Jack and Ally, two artistic souls coming together, on stage and in life. Theirs is a complex journey through the beauty and the heartbreak of a relationship struggling to survive. “I never thought, ‘How do I make it original?’ I just knew I had to make it authentic to tell the story I wanted to tell,” says Cooper who, in addition to directing and co-writing the screenplay, and starring as Jackson Maine, produced the film. He also co-wrote some of the music, which he performed alongside Lady Ga ga, who co-wrote much of it as well. In the film, Maine’s philosophy is intended to encourage the skittish ingenue to step into the spotlight, figuratively and literally. It could also be Cooper subtly revealing through his character why this story motivated him to finally test his own wings behind the scenes. “I’ve always known that I wanted to direct, but I also knew that I needed to have a point of view, to know why I was doing it, otherwise there was no reason to,” he says. “And I always wanted to tell a love story, because it feels like something everybody can relate to—the love, the loss of it, the high of it. It’s the thing that makes you feel the most alive. “One thing I’ve learned is that when you’re creating any kind of art, if you’re in the moment, you trust your instincts but can be flexible, too, you can make something that might shift someone’s way of looking at their world a little bit,” Cooper reflects. “And when your whole crew goes there with you? That’s a wonderful feeling. That everybody trusted my vision was exhilarating and, I think, gave me the confidence to keep at that daunting task every day. may press screening pero for invitation lang. kainis nga eh.